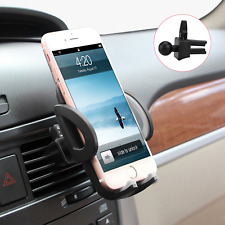 Magnetic Car Dash Mount Holder. Insert your smartphone, adjust up and down, tilt, and rotate 360-degrees with one hand for safer driving. CD Slot Phone Holder. Product type:CD Slot Phone Holder Mount. Unique round knot design,and 360 degree adjustable can easy get best view angle. 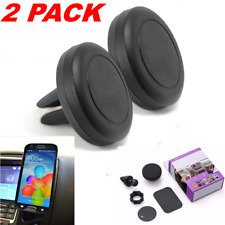 Universal 360 Degrees Rotation Long Arm Car Windscreen Cellphone Holder. 360-degree rotation is in order to provide multiple viewing angles from anywhere inside your vehicle. It is easy to install with no tools required. The base of the mount remains fixed into the air vent of your car and does not move, no matter how much swiveling or rotation you do. STURDY BASE: The high-quality rubber construction of the base of the mount is unique and very functional as well. STURDY BASE: The high-quality rubber construction of the base of the mount is unique and very functional as well. The base of the mount remains fixed into the air vent of your car and does not move, no matter how much swiveling or rotation you do. Incorporates 2 size fins for universal car air vent applications. Utilizes 4 strong magnets that creates a intensive magnetic force securing your device. Magnetic surface is made of premium soft rubber that prevents slipping and scratches on your phone. Universal 360 Rotation Suction Cup Car Mount Holder. Flexible arm holder can be adjusted to any angle for easy viewing. Heavy duty suction cup can secure the holder on any smooth surface as windshield, table, glass, etc. Brand Name: RAXFLY Type : Luxury Simple New Stable Durable Phone Car Stand Holder Feature 1: 360 Rotation Telescopic Boom Car Holder Feature 3: Universal Multi-functional Light to Instructions Compatible Model 2: For Samsung Galaxy Note9 S9 S8 Plus S6 S7 Edge ... Compatible Model 4: For Huawei Mate 10 Mate 10 Pro P20 P20 Pro P8 P9 P10 Lite Material: ABS Compatible Brand: Apple iPhone Use: Car Model Number: Universal Car Phone Holder Size : Supper Fit For 3. 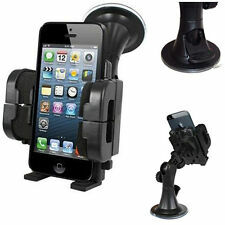 Universal Mobile Phone Mount Stand Magnetic Smartphone Holder Car Air Vent. Condition is New. Shipped with USPS Parcel Select Ground.may ship from different warehouses in three different countries. Built-in Iron Sheet: The finger ring has a built-in iron sheet, suitable for use with all magnetic holders. Multi-Function: You can easily mount your phone on the flat surface like desktop, sofa, kitchen and bed with your hands-free, providing you 360 degree rotation for watching movies from different viewing angles. Equipped with a cradle that has 360 degree rotation capability and a foldable leg, the smartphone can be positioned in any way, either in landscape or portrait orientation. Heavy duty handlebar grip has turn-lock knob to ensure a tight fit. Trending at C $16.57eBay determines this price through a machine-learned model of the product's sale prices within the last 90 days. Multi-Function: You can easily mount your phone on the flat surface like desktop, sofa, kitchen and bed with your hands-free, providing you 360 degree rotation for watching movies from different viewing angles. YOU WILL RECEIVE: 10x Cell Phone Finger Holder. Built-in Iron Sheet: The finger ring has a built-in iron sheet, suitable for use with all magnetic holders. Multi-Function: You can easily mount your phone on the flat surface like desktop, sofa, kitchen and bed with your hands-free, providing you 360 degree rotation for watching movies from different viewing angles. YOU WILL RECEIVE: 10x Cell Phone Finger Holder. Multi-Function: You can easily mount your phone on the flat surface like desktop, sofa, kitchen and bed with your hands-free, providing you 360 degree rotation for watching movies from different viewing angles.